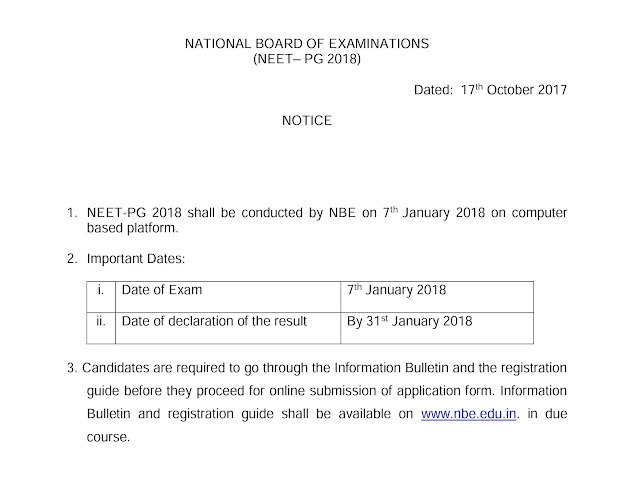 NEET-PG 2018 shall be conducted by NBE on 7th January 2018 on computer based platform. The examination will be conducted on a single day in single session i.e. all candidates will be taking the same question paper. There shall not be any equating or scaling of the marks obtained by the candidate. Please Like and Share this post. LIKE Our Facebook Page to get latest updates. Contact us @ edumedwebstore[at]gmail.com if you have any queries.